This article is about the character from Mario Tennis: Power Tour. For the coin, see Ace Coin. "Tina" redirects here. For information about the Flipside resident known as "Tina" in the PAL version of Super Paper Mario, see Muffy (1F). 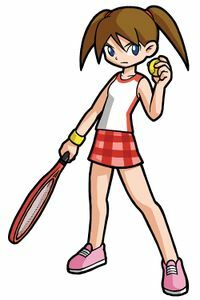 Ace (also known as Tina in Europe) is the female protagonist in the game Mario Tennis: Power Tour. Although the character's name can be changed, Ace is the default. She appears in the game whether the player chooses the male or the female protagonist. In both scenarios she is partners with the male protagonist, Clay. She sleeps on the left side of their room at the Royal Tennis Academy. She is described as a tomboy, and seems to have a somewhat short temper (this is only if the player chooses the male protagonist; if the player chooses to play as Ace, she is silent throughout the game). She has brown hair in two ponytails, a white T-shirt and a pink and red skirt with a checker design, just like her golf counterpart, Ella. She is also a technique character. This page was last edited on May 11, 2018, at 16:42.